Rice bowls are common dishes in Japan. Generally they have warm, simmered ingredients spooned over the top, such as braised beef. They are called ‘donburi’, which is both the name of the bowl in which they are served and also of the dish. This is a modern interpretation and a perfect recipe if you are watching both weight and health, with its whole grain rice, vegetables and raw fish. And the flavour is satisfyingly strong, because of the dressing. It also seems, perhaps because it is a beautiful dish, very centring to eat. There’s nothing to cut or wrestle with. It’s just you, simple food, a bowl and some chopsticks. Make it spicy by adding chilli to the dressing, or serving wasabi on the side. Make the dressing by mixing all the ingredients together. Cook the brown rice in plenty of boiling water until it is tender (it will still have a little bite in the centre of each grain), then drain and immediately stir in half the dressing. Cook the edamame and sugar snaps in boiling water for about two minutes, then drain and run cold water through them. Halve the sugar snaps lengthways. Half-peel the cucumber (so it has stripes down it), halve and scoop out the seeds. Cut the flesh into slices about ½ cm (¼in) thick. Cut the tuna into slices about 3mm (⅛in) thick. 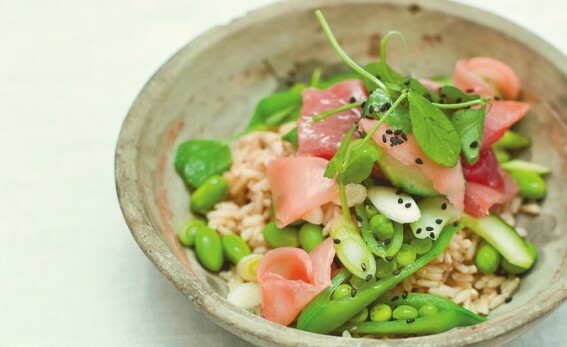 Divide the rice between six bowls and top with the beans and sugar snaps, the cucumber, tuna, pea shoots and spring onions. Spoon the rest of the dressing over the top and add the ginger and sesame seeds. Serve immediately. The variations on this are endless and you can make really pretty combinations. Crunch is nice, so a version with matchsticks of carrots, bean sprouts and radishes is good. You can also add fried tofu with soy sauce, purple-sprouting broccoli, fried shiitake or oyster mushrooms, slivers of avocado, raw salmon or mackerel, or cooked chicken.